medicine, daily necessities, hardware, or any other products loaded in box or tray. 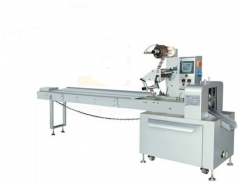 This machine adopts PLC for main control, hence steady in performance and easy to operate. Human-machine interface in Chinese(English), making the setting and save easy and quick. Main motor equipped with high quality AC frequency converter which makes step less speed changing. High accuracy photoelectric detection tracing system with automatic compensation in both directions for reliable accuracy. Non-stage transmission used for the adjustment of bag length. which makes machine much more durable, stable and precise. 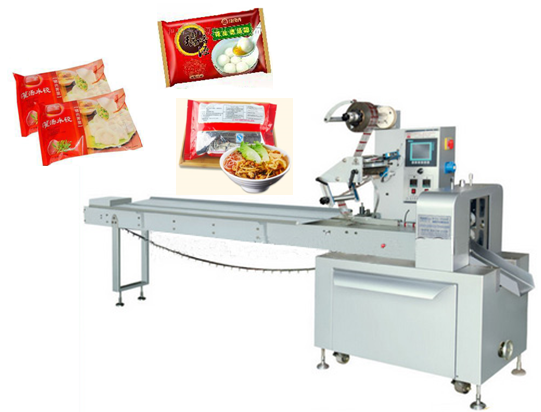 The conveying chain can be adjusted without stopping the machine, convenient and sensitive. Adjustable end sealing structure makes the sealing more perfect without cutting on the bags. The complete machine shell is made of high quality stainless steel.